Who is the greatest Indian Test captain of all? The blue sparkline below provides a snapshot of the history of the Indian Test team, from June 25, 1932 when they took the field at Lord's for their inaugural Test, until today. 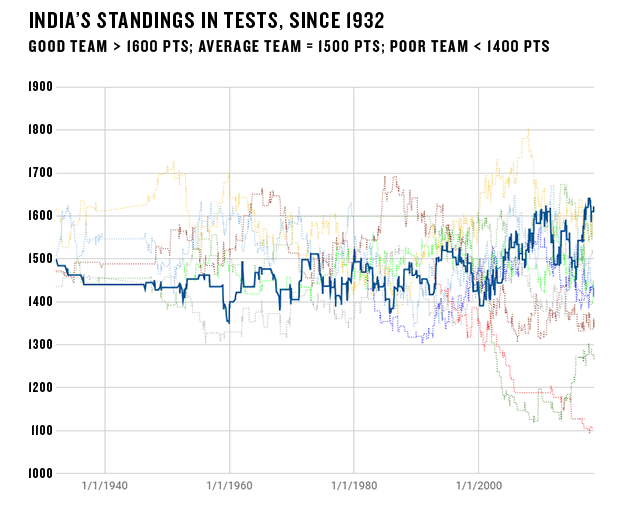 The numbers on the vertical axis - 1400, 1500 and 1600 - can be roughly translated to poor, average and good, and so the first inference from the graph is that for much of their history, India have been a below-average Test team, which is not new information to anyone who follows cricket. It is only in the last quarter of the span that the team surfaces above the average marker consistently. That, too, is known. The graph is much like views of Himalayan peaks from a north Indian hill station. Seen in totality, the mountains reveal their breadth and scale; focus on one and you can unravel not just the physical dimensions but the ridges, the valleys, the stories and the legends. Consider the right-most peak in the above figure, which towers above everything else. That's the Indian team under Virat Kohli's captaincy. The graph shows the Indian Test team's ratings as calculated using an adaptation of the Elo algorithm, the beautifully simple yet extremely powerful mathematical tool that was developed around 60 years ago to determine the rankings of chess players. Since then, variations of Elo have been applied to many other sports - baseball, football, basketball, tennis, boardgame championships, electronic sports, and even in consumer apps such as Tinder. The algorithm uses form, history, the quality of opposition, and in the current study, the difference in home-away and subcontinental-outside conditions, by just considering the result of a game (see explainer graphic below). When a team wins, it extracts points out of the opposition; when it loses, it hands points to the opponent. The number of points gained or lost depends on the factors above. 1) Measuring the expectation of win of each opponent in a match, which depends on the difference in the teams' current ratings, which in turn depends on what happened in their previous games, and so on. 2) Applying a weight factor, K, which determines the final exchange of points between teams, or ratings fluctuations. This number usually varies between 20 and 40 for different sports. Because the number of Test matches played a year is rather low compared to the number of games in other league sports, a high K-factor has been used. Using a second value of K-factor, a lower one, helped in accounting for home matches. For example, for Australia winning the Pune Test in India in 2016, a K-factor of 48 was used, but when India beat Australia in the next Test in Bangalore, the K-factor was 32. Kohli's reign started with the team in a trough, when MS Dhoni announced his retirement in Australia mid-tour in 2014, but India were soon on a hot streak at home that ended against Australia in Pune three years later. Indian Test teams of the past had enjoyed success at home, but none were ruthless enough to close out matches with such regularity. At their peak - after a 3-0 win in Sri Lanka last year - Kohli's India hit 1641 points, the best that any Indian team has ever achieved. Will Kohli's team discover taller peaks, or will they slip like many of their predecessors? The final judgement on how good this Indian team is compared to previous ones will have to be reserved until January, by which time they will have completed tours of England and Australia. In this adaptation of the Elo algorithm to cricket, all teams were handed 1500 points at the start, and after the interactions started in 1877 with the first Test, the respective positions of the team were auto-adjusted. For example, England lost the first Test to Australia, in Melbourne, and their rating dipped to 1484, while Australia's rose to 1516. By the time India arrived on the scene, Australia had established their dominance and were rated 1616, England were second at 1508, while three other teams - South Africa, West Indies and New Zealand - were all below 1500. Once each Test result is accounted for, the above picture emerges. The blue sparkline shown at the start appears again in bold, along with the ratings of the other Test teams at different points of time. The scope of this piece is limited to Indian Test team, so the results before 1932 haven't been displayed, but they were as much part of the calculation as any match since. Before going further, pause to observe the maroon and the yellow squiggles. Remember, we defined 1600 as good? West Indies of the 1980s and Australia of the 2000s smashed the roof during their respective highs. Kohli's team might be No. 1 in Tests at the moment and the best Indian Test outfit ever, but they are yet to hit the Everest-like heights of Australia and West Indies. Under Kohli, India have risen from 1488 rating points to the present 1611. The team has been heading upward, but it is an unfinished story, though, with the potential of becoming either a blockbuster or a flop. Not many captains in India's Test history were able to lift the status of the team. When Dhoni started as captain in November 2008, the team had a rating of 1570. When he passed the baton to Kohli, the team had dropped to 1488 rating points, into the below-average category. For the first three years, Dhoni built on the platform that preceding captains had laid and pulled the team to the top of Test rankings. Then England 2011 happened, followed by Australia 2011-12. Scarred though he might have been by the two whitewashes, Dhoni survived another four years as captain. After a brief revival with home wins, India's next Test tours to England and Australia were almost as poor. For all the trophies that Dhoni collected in limited-overs cricket, the difference between the rating of the team at the start of his reign and at the end meant he left with the worst rating of all major captains in Indian history. 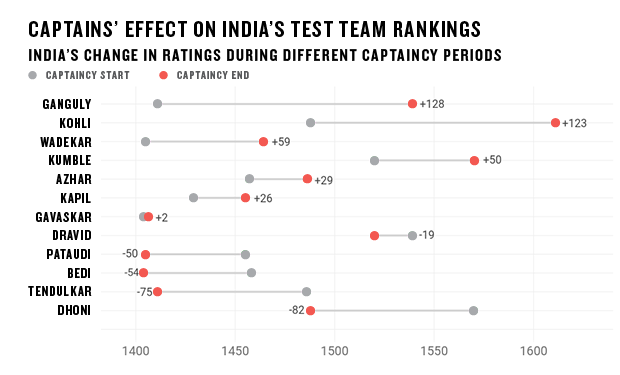 Sachin Tendulkar's time as a captain had more lows than highs, but the drop the team saw during his reign was smaller than the one under Dhoni. India also dropped rating points during the stints of MAK Pataudi, Bishan Bedi and Rahul Dravid. Compared to these men, Kohli has had a superb run so far. However, one captain has set an example Kohli's team is yet to beat. 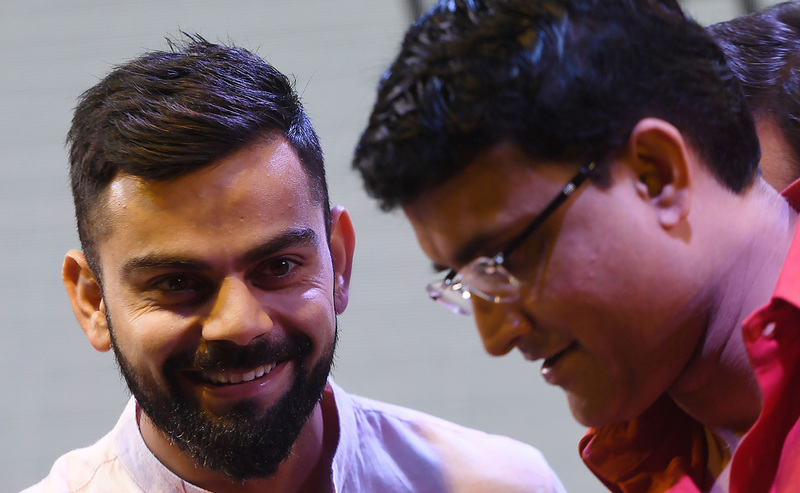 Sourav Ganguly has been widely considered the captain who instilled a belief in the team that they could compete anywhere. Ganguly's team tripped up a rampaging Australia at home, drew in England, drew in Australia, and won in Pakistan. He was handed a poor team - 1411 points - that was scarred by a 0-3 washout in Australia, not to mention the match-fixing crisis. By the time he left, India, at 1539 rating points, were rated well above average. Dravid, despite Test wins in England and South Africa, lost Tests in India, and so dropped some points, but the team rose under Anil Kumble. Another captain who had a significant impact on the team was Ajit Wadekar. Leading India to their first-ever series wins in West Indies and England in 1971, Wadekar boosted India's ratings by 59 points during his time at the helm. Beating a higher-rated team fetches a team a bounty of points. So does every win overseas (for India, subcontinent conditions have been marked as home). 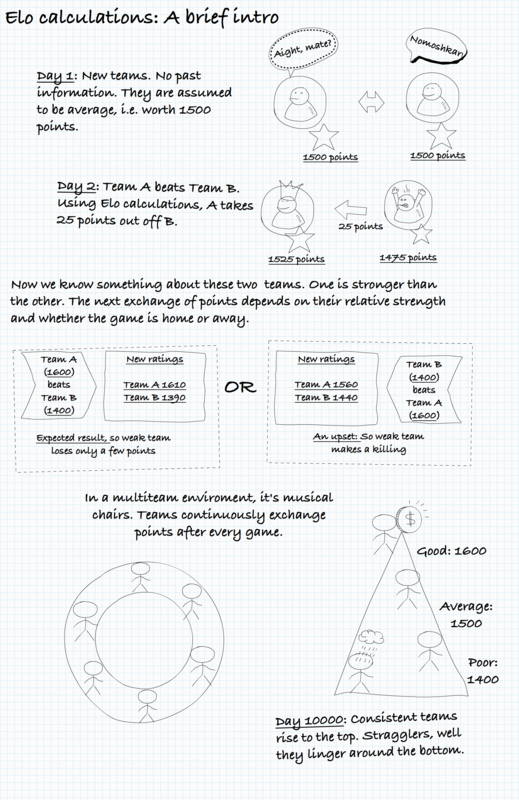 The best way, then, to hit a jackpot is to beat a higher-ranked team in its backyard. The champion Australian and West Indian teams did this consistently, and this accounts for the high maroon and yellow ranges. Coming to India in England, let's look at the successful tours. There aren't many - 1971, 1986, 2002 (drawn), and 2007. During the course of the 1-0 win in 1971, Wadekar's team gained 49 rating points. Kapil's team had a similar haul of 48 points in 1986, when they won 2-0. 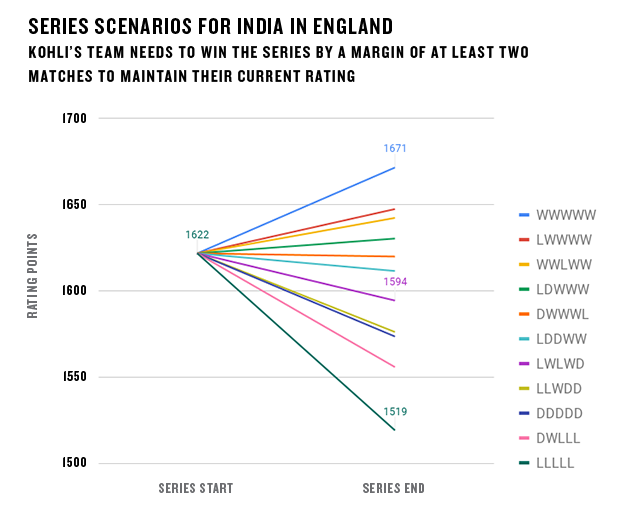 The reason Wadekar's team gained more points with a less impressive result was because England were then a much better team compared to the one in 1986. In 2002, Ganguly's team actually dropped five rating points in the drawn series. Dravid's team, in 2007, gained 37 rating points in their 1-0 win. Dhoni's team was on the rise both times it landed in England but lost 65 points in the 0-4 drubbing of 2011 and 56 in the 1-3 of 2014. They took such a hit because they were not expected to do so badly on either occasion. Mohammad Azharuddin's side also lost two series in England - in 1990 and 1996 - but did not lose as many points: two defeats in six Tests was not such a bad result for a team not expected to do well. 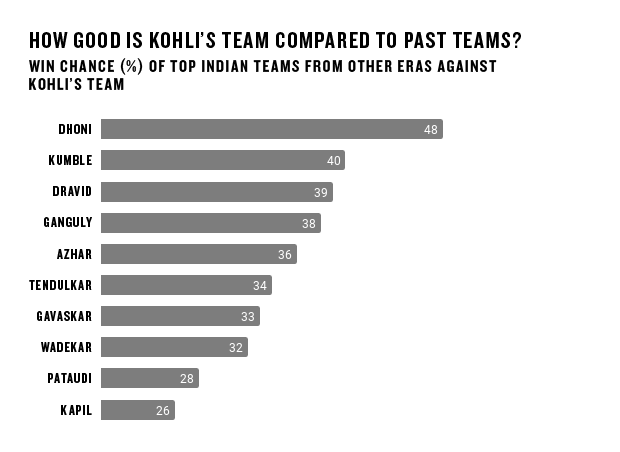 This year, Kohli's team will enter England with a rating-points advantage no other Indian team has had before: despite their poor record in the country, they are statistically firm favourites. A poor run in the last couple of years means England are in a trough. Therein lies the opportunity for India. Therein lies the trap as well. If India lose the series, their ratings will take a major hit. To stay afloat at their current level, they will need to beat England by a margin of two matches. Anything less and they will drop points. A 5-0 result seems far-fetched but if it does happen, Kohli's team will set standards unseen in Indian cricket. If there are signals to be picked up from the number of times Kohli has talked about England and Australia tours in the past year, he understands that his legacy depends on them. Is Dhoni India's best-ever captain?